The Unified Modeling Language (UML) is a general-purpose, developmental, modeling language in the field of software engineering that is intended to provide a standard way to visualize the design of a system. The creation of UML was originally motivated by the desire to standardize the disparate notational systems and approaches to software design. It was developed by Grady Booch, Ivar Jacobson and James Rumbaugh at Rational Software in 1994–1995, with further development led by them through 1996. In 1997 UML was adopted as a standard by the Object Management Group (OMG), and has been managed by this organization ever since. In 2005 UML was also published by the International Organization for Standardization (ISO) as an approved ISO standard. Since then the standard has been periodically revised to cover the latest revision of UML. UML has been evolving since the second half of the 1990s and has its roots in the object-oriented programming methods developed in the late 1980s and early 1990s. The timeline (see image) shows the highlights of the history of object-oriented modeling methods and notation. It is originally based on the notations of the Booch method, the object-modeling technique (OMT) and object-oriented software engineering (OOSE), which it has integrated into a single language. Rational Software Corporation hired James Rumbaugh from General Electric in 1994 and after that the company became the source for two of the most popular object-oriented modeling approaches of the day: Rumbaugh's object-modeling technique (OMT) and Grady Booch's method. They were soon assisted in their efforts by Ivar Jacobson, the creator of the object-oriented software engineering (OOSE) method, who joined them at Rational in 1995. Under the technical leadership of those three (Rumbaugh, Jacobson and Booch), a consortium called the UML Partners was organized in 1996 to complete the Unified Modeling Language (UML) specification, and propose it to the Object Management Group (OMG) for standardisation. The partnership also contained additional interested parties (for example HP, DEC, IBM and Microsoft). The UML Partners' UML 1.0 draft was proposed to the OMG in January 1997 by the consortium. During the same month the UML Partners formed a group, designed to define the exact meaning of language constructs, chaired by Cris Kobryn and administered by Ed Eykholt, to finalize the specification and integrate it with other standardization efforts. The result of this work, UML 1.1, was submitted to the OMG in August 1997 and adopted by the OMG in November 1997. After the first release a task force was formed to improve the language, which released several minor revisions, 1.3, 1.4, and 1.5. The standards it produced (as well as the original standard) have been noted as being ambiguous and inconsistent. As with database Chen, Bachman, and ISO ER diagrams, class models are specified to use "look-across" cardinalities, even though several authors (Merise, Elmasri & Navathe amongst others) prefer same-side or "look-here" for roles and both minimum and maximum cardinalities. Recent researchers (Feinerer, Dullea et al.) have shown that the "look-across" technique used by UML and ER diagrams is less effective and less coherent when applied to n-ary relationships of order strictly greater than 2. Feinerer says: "Problems arise if we operate under the look-across semantics as used for UML associations. Hartmann investigates this situation and shows how and why different transformations fail. ", and: "As we will see on the next few pages, the look-across interpretation introduces several difficulties which prevent the extension of simple mechanisms from binary to n-ary associations." UML 2.0 major revision replaced version 1.5 in 2005, which was developed with an enlarged consortium to improve the language further to reflect new experience on usage of its features. Although UML 2.1 was never released as a formal specification, versions 2.1.1 and 2.1.2 appeared in 2007, followed by UML 2.2 in February 2009. UML 2.3 was formally released in May 2010. UML 2.4.1 was formally released in August 2011. UML 2.5 was released in October 2012 as an "In progress" version and was officially released in June 2015. Formal version 2.5.1 was adopted in December 2017. UML Diagram Interchange version 1.0. It continues to be updated and improved by the revision task force, who resolve any issues with the language. Although originally intended for object-oriented design documentation, UML has been extended to a larger set of design documentation (as listed above), and been found useful in many contexts. 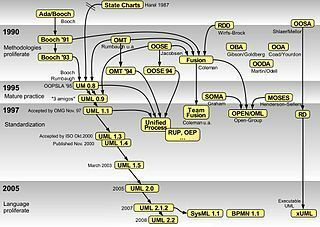 UML is not a development method by itself; however, it was designed to be compatible with the leading object-oriented software development methods of its time, for example OMT, Booch method, Objectory and especially RUP that it was originally intended to be used with when work began at Rational Software. It is important to distinguish between the UML model and the set of diagrams of a system. A diagram is a partial graphic representation of a system's model. The set of diagrams need not completely cover the model and deleting a diagram does not change the model. The model may also contain documentation that drives the model elements and diagrams (such as written use cases). Static (or structural) view: emphasizes the static structure of the system using objects, attributes, operations and relationships. It includes class diagrams and composite structure diagrams. Dynamic (or behavioral) view: emphasizes the dynamic behavior of the system by showing collaborations among objects and changes to the internal states of objects. This view includes sequence diagrams, activity diagrams and state machine diagrams. UML models can be exchanged among UML tools by using the XML Metadata Interchange (XMI) format. In UML, one of the key tools for behavior modelling is the use-case model, caused by OOSE. Use cases are a way of specifying required usages of a system. Typically, they are used to capture the requirements of a system, that is, what a system is supposed to do. These diagrams may all contain comments or notes explaining usage, constraint, or intent. Structure diagrams emphasize the things that must be present in the system being modeled. 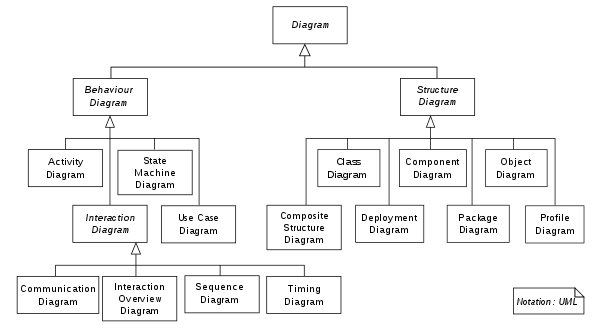 Since structure diagrams represent the structure, they are used extensively in documenting the software architecture of software systems. For example, the component diagram describes how a software system is split up into components and shows the dependencies among these components. Behavior diagrams emphasize what must happen in the system being modeled. Since behavior diagrams illustrate the behavior of a system, they are used extensively to describe the functionality of software systems. As an example, the activity diagram describes the business and operational step-by-step activities of the components in a system. Interaction diagrams, a subset of behavior diagrams, emphasize the flow of control and data among the things in the system being modeled. For example, the sequence diagram shows how objects communicate with each other regarding a sequence of messages. The Object Management Group (OMG) has developed a metamodeling architecture to define the UML, called the Meta-Object Facility. MOF is designed as a four-layered architecture, as shown in the image at right. It provides a meta-meta model at the top, called the M3 layer. This M3-model is the language used by Meta-Object Facility to build metamodels, called M2-models. The most prominent example of a Layer 2 Meta-Object Facility model is the UML metamodel, which describes the UML itself. These M2-models describe elements of the M1-layer, and thus M1-models. These would be, for example, models written in UML. The last layer is the M0-layer or data layer. It is used to describe runtime instances of the system. The meta-model can be extended using a mechanism called stereotyping. This has been criticised as being insufficient/untenable by Brian Henderson-Sellers and Cesar Gonzalez-Perez in "Uses and Abuses of the Stereotype Mechanism in UML 1.x and 2.0". UML has been marketed for many contexts. It has been treated, at times, as a design silver bullet, which leads to problems. UML misuse includes overuse (designing every part of the system with it, which is unnecessary) and assuming that novices can design with it. It is considered a large language, with many constructs. Some people (including Jacobson) feel that UML's size hinders learning (and therefore, using) it. ^ "ISO/IEC 19501:2005 - Information technology - Open Distributed Processing - Unified Modeling Language (UML) Version 1.4.2". Iso.org. 1 April 2005. Retrieved 7 May 2015. ^ "ISO/IEC 19505-1:2012 - Information technology - Object Management Group Unified Modeling Language (OMG UML) - Part 1: Infrastructure". Iso.org. 20 April 2012. Retrieved 10 April 2014. ^ a b c d "OMG Unified Modeling Language (OMG UML), Superstructure. Version 2.4.1". Object Management Group. Retrieved 9 April 2014. ^ "UML Specification version 1.1 (OMG document ad/97-08-11)". Omg.org. Retrieved 22 September 2011. ^ "UML". Omg.org. Retrieved 10 April 2014. ^ Génova et alia 2004 "Open Issues in Industrial Use Case Modeling"
^ "Will UML 2.0 Be Agile or Awkward?" (PDF). Retrieved 22 September 2011. ^ Elmasri, Ramez, B. Shamkant, Navathe, Fundamentals of Database Systems, third ed., Addison-Wesley, Menlo Park, CA, USA, 2000. ^ "A Formal Treatment of UML Class Diagrams as an Efficient Method for Configuration Management 2007" (PDF). Retrieved 22 September 2011. ^ "James Dullea, Il-Yeol Song, Ioanna Lamprou - An analysis of structural validity in entity-relationship modeling 2002" (PDF). Retrieved 22 September 2011. ^ ""Reasoning about participation constraints and Chen's constraints" S Hartmann - 2003" (PDF). Retrieved 17 August 2013. ^ "UML 2.0". Omg.org. Retrieved 22 September 2011. ^ a b c "UML". Omg.org. Retrieved 22 September 2011. ^ "UML 2.5.1 specification". Omg.org. Retrieved 24 October 2018. ^ OMG. "OMG Formal Specifications (Modeling and Metadata paragraph)". Retrieved 12 February 2016. ^ "Issues for UML 2.6 Revision task Force mailing list". Omg.org. Retrieved 10 April 2014. ^ Satish Mishra (1997). "Visual Modeling & Unified Modeling Language (UML): Introduction to UML". Rational Software Corporation. Accessed 9 November 2008. ^ a b "UML, Success Stories". Retrieved 9 April 2014. ^ Manuel Almendros-Jiménez, Jesús & Iribarne, Luis. (2007). Describing Use-Case Relationships with Sequence Diagrams. Comput. J.. 50. 116-128. 10.1093/comjnl/bxl053. ^ "UML 2.4.1 Infrastructure". Omg.org. 5 August 2011. Retrieved 10 April 2014. ^ B. Henderson-Sellers; C. Gonzalez-Perez (2006). "Uses and Abuses of the Stereotype Mechanism in UML 1.x and 2.0". in: Model Driven Engineering Languages and Systems. Springer Berlin / Heidelberg. ^ "UML 2.5: Do you even care?". "UML truly is ubiquitous"
^ "Death by UML Fever". ^ "Ivar Jacobson on UML, MDA, and the future of methodologies". Ambler, Scott William (2004). The Object Primer: Agile Model Driven Development with UML 2. Cambridge University Press. ISBN 0-521-54018-6. Fowler, Martin. UML Distilled: A Brief Guide to the Standard Object Modeling Language (3rd ed.). Addison-Wesley. ISBN 0-321-19368-7. Jacobson, Ivar; Grady Booch; James Rumbaugh (1998). The Unified Software Development Process. Addison Wesley Longman. ISBN 0-201-57169-2. Martin, Robert Cecil (2003). UML for Java Programmers. Prentice Hall. ISBN 0-13-142848-9. Noran, Ovidiu S. "Business Modelling: UML vs. IDEF" (PDF). Retrieved 28 December 2005. Horst Kargl. "Interactive UML Metamodel with additional Examples". Wikimedia Commons has media related to Unified Modeling Language.